Last week I had the pleasure of visiting New York city to see my cousin perform on opening night in the Broadway play "The Play that Goes Wrong". Amelia McClain is a star! What a fun night of theatre! On my last day in the city I visited a dozen galleries in Chelsea, and did I get an eyeful. As you can probably guess, much of what I saw was abstract, or at least abstracted. And there were several that caught my eye. 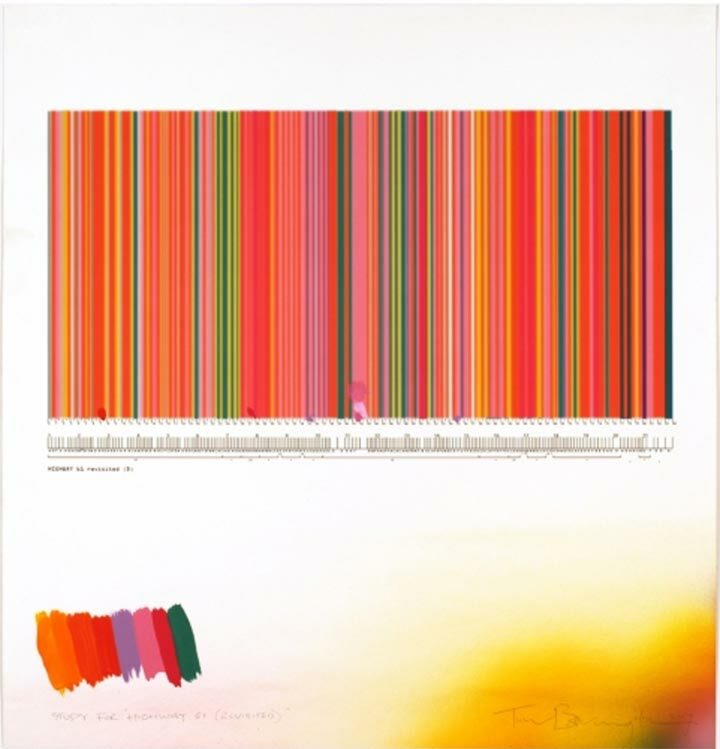 At the UNIX Gallery, I fell in love with "Something Surprising" by English artist William Bradley. I love the white negative space, the colors, and the composition in general. I was told that Bradley first mocks up his ideas in water color in a small format and then translates that onto the larger canvas. 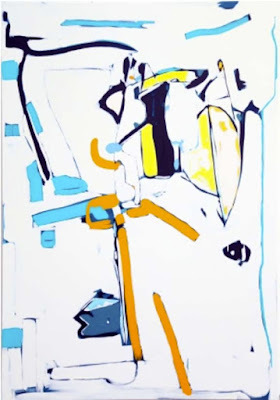 At the Morgan Lehman Gallery I was intrigued by the work of Tim Bavington, whose current work is inspired by music. 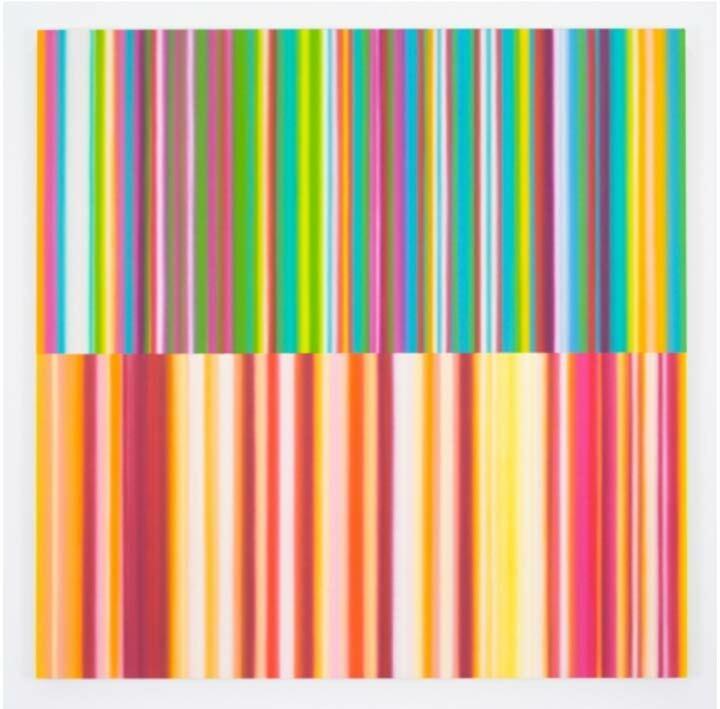 The vertical bands of color represent melody, beat, etc., in the particular piece of music, translating aural experiences into visual ones. The gallery has examples of both the initial watercolor on paper and larger synthetic polymer on canvas pieces as well as archival ink jet prints. I particularly enjoyed seeing the pieces where the artist had tested the synthetic polymer colors against the watercolor or ink piece. At the Kim Foster Gallery I found a new twist on encaustic painting. Christian Faur uses crayons, pointy ends sticking out, to create beautiful large mosaic paintings. He uses the handmade crayons like pixels, arranging tens of thousands of them to create each painting. 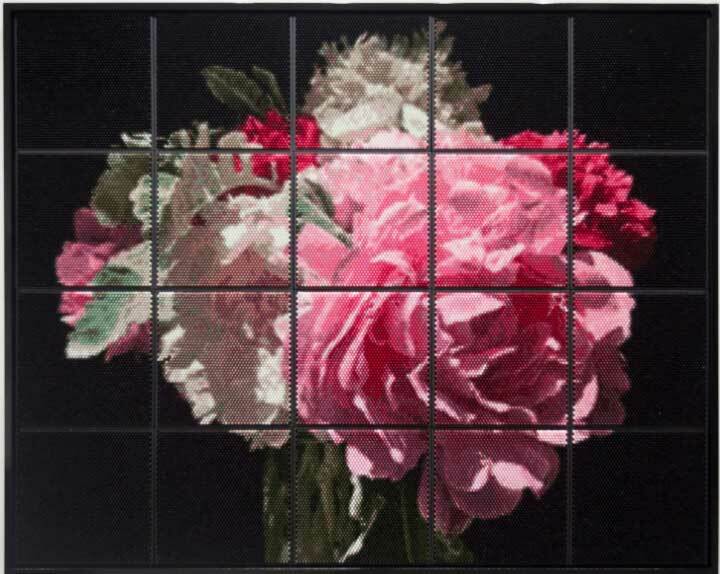 Think painting, Pointillism, and digital photography all rolled into one. There were other types of Faur's work in the exhibit, including portraits in a more classic encaustic style, though you could see the melted crayon shapes. I thought these were also fabulous. While the finished work of each of these artists is compelling, it's the process that grabs my attention. And it's the process that makes them unique. When most of us think of process, we think of how the paint is applied, the steps used to create layers (or not), how the drawing is created on the support (or not), etc. But these artists are going one step further, or starting a few steps earlier, and using their medium in a new way (Faur's crayons), gathering inspiration and structure from an auditory experience (Bavington), or prototyping the work in a different medium (Bradley). We are probably more familiar with Bradley's approach, since many of us were taught do a value sketch before we paint. His was the first work to attract my attention (I won't tell you about all the paintings that didn't reach out to me AT ALL). And it was a great introduction to the more abstracted processes of the other two. Yes, I think you can abstract the process, not just the subject matter! I'm using abstracted here to describe the simplification of the process into a structural/design phase and an assembly phase. The brain work is in the design phase, though careful assembly is required. My little foray into abstract art in Chelsea has left me with a lot to think about as I continue the journey of abstraction in my own work. While I usually show some of my own work in each blog post, I won't attempt that in this one. If you'd like to get a daily view of my work, take a look at my Instagram or Facebook page. You can sign up to have posts on this blog emailed to you on the right hand side of this page. And for periodic announcements, free art goodies, and special offers, sign up at the bottom of this page. I've gone a bit sunflower mad. Sunflowers are one of my favorite painting subjects. There's so much to them, they're "chunky", in that there are lots of shapes and angles, and they have mass and weight. And bright colors too. There's a lot to love about a sunflower. 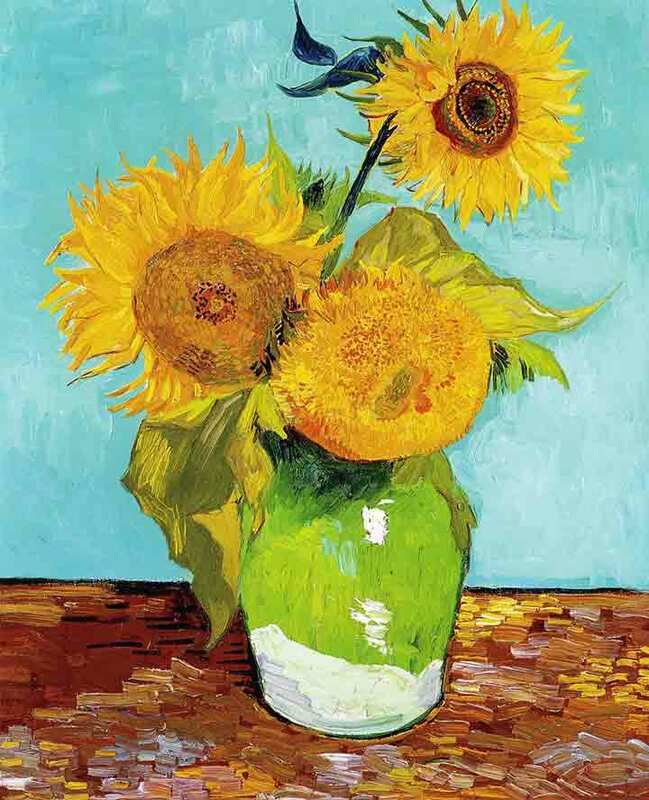 I'm not the only artist that as loved them, Van Gogh sunflowers, anyone? 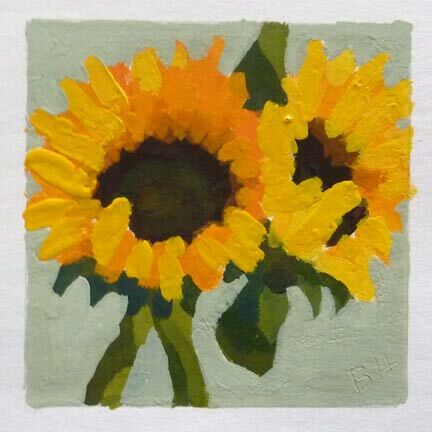 I've been using sunflowers this month as a way to learn a few things. One of them is how to make a time lapse video. Another is to play with abstraction in my painting. To do that I'm experimenting with acrylics. 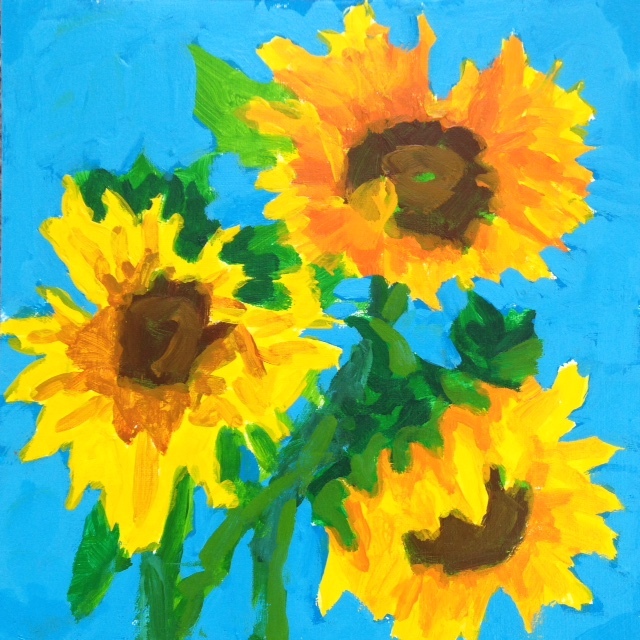 Well, to be honest I've painted sunflowers with oil, acrylic, and pastel in the last few days. It's so much fun to stretch my wings! But the most exciting sunflower adventure I've had was visiting a field of sunflowers in eastern Massachusetts. Wow! Colby Farm is something else. You can wallow in sunflowers there. I was interested to find on a late afternoon visit that the flowers were not facing the sun. In fact the leaves of the sunflower follow the sun by a process called heliotropism, but only the budding flowers do this. Once the flowers are mature the stem stiffens and they always point east towards the sunrise. I was rewarded one morning last week by sunflowers awash in light. 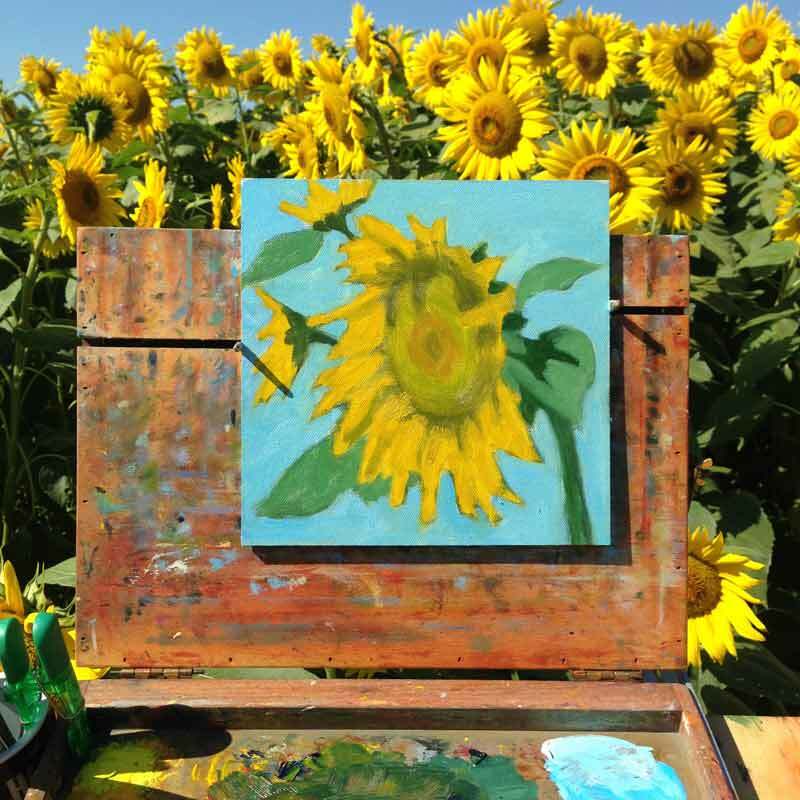 If you want more sunflowers, there are lots of them (including videos of Colby Farm) on my Instagram, along with a selection of my sunflower paintings. I've spent the last few weeks re-launching my Instagram presence, which includes beautiful images of paintings, studio shots, my new demo videos, and what I'm working on "right now". I'd love to have you follow me there. You can do that on your phone with the Instagram app, or online at instagram.com/bobbiheathart.